Found this on Digg, also picked up by NBC affiliate. Wired.com reports that Anonymous has flooded Scientology servers with a distributed denial of service attack, is choking the Church's phone lines with prank calls and sending looped faxes of solid black pages. Keep in mind that is merely the first day. When war is declared against an organization, it can be very serious. Especially when the attackers are perceived as the heroes. Its no laughing matter, over the past 10 years or so I've seen these DOS/DDOS attacks and coordinated extortion attacks work very effectively. No matter how great or prepared an organization is (minus governments), they literally go out of business because they truly are expelled from the net. The way it happens is however the org connects to the net is attacked relentlessly up the line until noone will provide them with a connection, I mean nobody. This isn't against just some small orgs but orgs that specialize in network redundancy and preventing DOS attacks. They get smoked if the attackers are truly motivated. The lesson here is only for organizations, not individuals.. Don't offend the wrong people on the net, sometimes they really do have connections to legions of bots, zombies, and underground communities that specialize in extortion, identity theft, etc..
Hello, Scientology. We are Anonymous. Over the years, we have been watching you. Your campaigns of misinformation; suppression of dissent; your litigious nature, all of these things have caught our eye. With the leakage of your latest propaganda video into mainstream circulation, the extent of your malign influence over those who trust you, who call you leader, has been made clear to us. Anonymous has therefore decided that your organization should be destroyed. For the good of your followers, for the good of mankind--for the laughs--we shall expel you from the Internet and systematically dismantle the Church of Scientology in its present form. We acknowledge you as a serious opponent, and we are prepared for a long, long campaign. You will not prevail forever against the angry masses of the body politic. Your methods, hypocrisy, and the artlessness of your organization have sounded its death knell. You cannot hide; we are everywhere. We cannot die; we are forever. We're getting bigger every day--and solely by the force of our ideas, malicious and hostile as they often are. 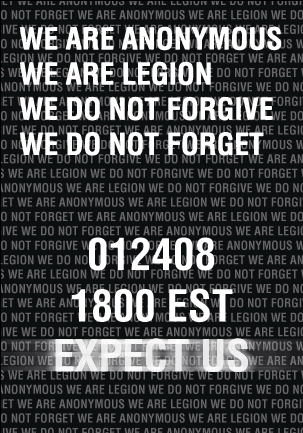 If you want another name for your opponent, then call us Legion, for we are many. Yet for all that we are not as monstrous as you are; still our methods are a parallel to your own. Doubtless you will use the Anon's actions as an example of the persecution you have so long warned your followers would come; this is acceptable. In fact, it is encouraged. We are your SPs. Gradually as we merge our pulse with that of your "Church", the suppression of your followers will become increasingly difficult to maintain. Believers will wake, and see that salvation has no price. They will know that the stress, the frustration that they feel is not something that may be blamed upon Anonymous. No--they will see that it stems from a source far closer to each. Yes, we are SPs. But the sum of suppression we could ever muster is eclipsed by that of the RTC. Knowledge is free. We are Anonymous. We are Legion. We do not forgive. WE DO NOT FORGET. Expect us.